Smartphones and tablets are absurdly useful—and it is incredible what you can do with them. We’ve featured projects on our site which teach you how you can do everything from turn your phone’s camera into a black light to give your phone a creative makeover. But the newest project I’ve found by Creative Mom may be one of the most creative yet. 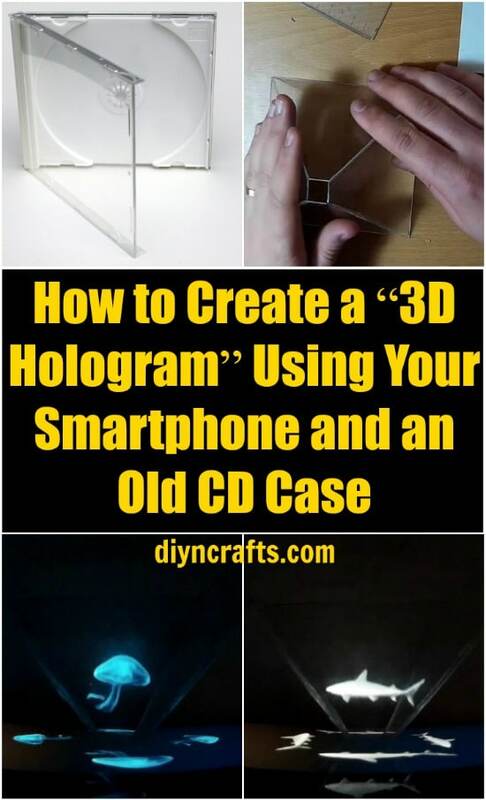 Using nothing more than an old CD case and your smartphone or tablet, you can create a 3D hologram! What a cool thing to put on your coffee table! The basic instructions are ridiculously simple. Grab a few old CD cases and cut out four equilateral triangles with the tips removed. Connect them together with hot glue, and then place them over your smartphone or tablet on the coffee table. I recommend doing something to ensure that the edges are not sharp so you won’t scratch your phone. Then turn off the lights and prepare to be amazed. To be clear, this is not technically a 3D hologram. The image from the smartphone or tablet is being projected onto all four sides of the pyramid, so you can see it from every angle. But the image itself is not actually 3D (what did you expect? We are talking about pieces of plastic here and a little hot glue). But it is pretty cool just as it is since you can get a nice bright vertical image. If you decide to give this project a try, you should get a lot of great comments from visitors at parties. It’s sure a unique centerpiece—a lot more exciting and unusual than a vase or a book! That’s really cool. The star wars futuristic technology finally come into reality.